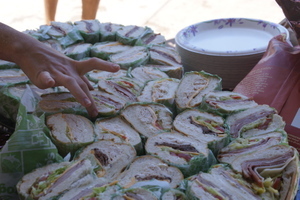 Sometimes, there's nothing like a giant plate of sandwiches. Especially if it's at a pool party for your kid's 5th birthday and everyone is hungry from swimming. The best part though, is the leftovers. There's nothing awesomer than being able to go the fridge and pull out an Italian combo anytime you feel like it. I feel like Stephanie Plum (and if you've read Twelve Sharp, you know what I'm talkin' 'bout). 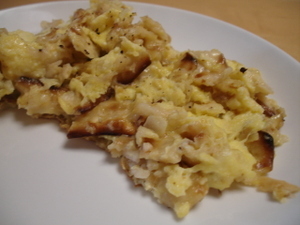 Our quick lunch today was a savory Matzo Brei. It's the only way Bunny, my four-year-old, will eat eggs...which is fine because in this family, we all love to eat it. This recipe is probably not "traditional," but it works for us. Saute onion in butter and oil over medium heat until translucent. Add squeezed matzo and fry until slightly crisp. Pour in eggs. Salt and pepper to taste. Scramble until soft but set (or cook like a frittata making a big "pancake.") I served this with sliced avocado and canteloupe balls on the side. Serves 3-4. 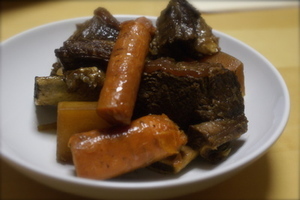 This is one of my kids' favorite meals. 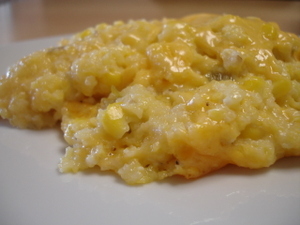 It combines everything they love to eat—cheese, corn, and polenta—in one dish. (My older daughter picks out the green chiles but my toddler eats them.) I serve this along side a green salad for an easy weeknight meal, but it could easily be a side dish for a Tex-Mex meal or an accompaniment to grilled chicken, pork, or shrimp. 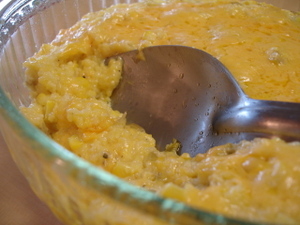 Stir until polenta is incorporated with the liquid then add butter. Mix well, then add the chiles and corn. 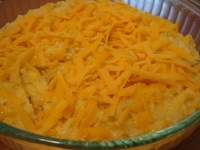 Heat that through (about 3-5 minutes) then add cheese, reserving some for the top. Remove from hear (polenta will not be cooked through, that's okay.) Stir quickly then turn the mixture out into a greased glass Pyrex dish (prefereably with a cover) or similar pan. Sprinkle remaining cheese on top. Cover (or cover tightly with foil). Bake for 35-45 minutes until mixture is bubbly. For kids, let cool slightly before serving. For adults, pass the Cholula hot sauce. I know this sounds totally strange, but trust me, it's good. One of the cookbooks that every parent should have in their arsenal is Joie Warner's No-Cook Pasta Sauces. Shoot, I bought it long before I ever became a parent because I love uncooked sauces. Using her cookbook you can make wonderful pastas even in the warm summer months. Yes, you still have to boil water for the pasta, but you can escape from the kitchen since the sauces cook themselves. 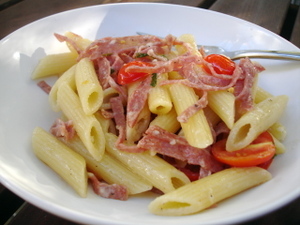 Then you can sit outside and enjoy your dinner as we did when I made the uncooked salami pasta. 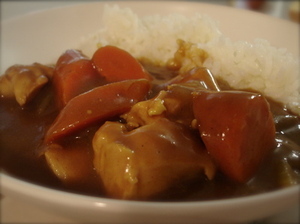 My recipe is adapted from hers, but the technique of putting everything into a heat-proof bowl is hers. Put salted pasta water on to boil. Set this bowl on-top-of or next to the pasta pot while water comes to a boil and pasta cooks so that butter melts and flavors meld. Cook one package of penne (or other short pasta) until al dente (usu. 1-2 minutes less than what the package recommends). Before draining reserve a cup of pasta water. Drain pasta and return to pot. Add the "sauce" from the bowl along with any pasta water needed to loosen the sauce. I found that because the salami and cheese are so salty, no salt was needed. No pepper either. Okay this time, I mean it. I am going to cook corned beef at least once more before next St. Patrick's Day. It's so good. Every time I eat it I say, "It's so good! and then a year goes by. To go with the corned beef I made smashed potatoes (butter gold potatoes roughly mashed with butter, buttermilk, and regular milk) and soda bread (which I baked in my cast iron skillet). The best part of dinner was sitting outside (outside! in March!) eating our dinner. It was a lovely evening and from our vantage point we could see all the kids (all 9 of 'em) piled on top of each other watching tv. We could sit and relax and talk and laugh while the kids watched movies and ate cookies that they thought were sneaking without us knowing about it. Instead of the Guinness we ended up drinking many (many) bottles of wine, and the kids stayed up almost three hours past their bedtime, but it was okay. It was one of the best times we've had in a long, long time. While my soda bread bakes, I'm reposting this. Why do we only eat this once a year? It's just too damn good to be eaten once a year. It's a meal that cooks itself all in one pot, and there ain't nothing wrong with that. 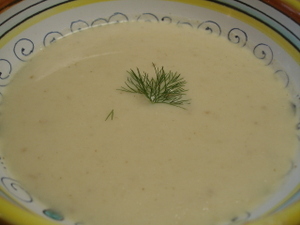 Serve with soda bread on the side. And beer. Plenty of beer. When buying your brisket, plan on about 1 lb. per person (more if you want leftovers) since there usually is a fair amount of fat to account for and it shrinks quite a bit when cooking. Place brisket fat side up in a dutch over or other heavy bottomed pot and cover with cold water. Add garlic, bay leaf, peppercorns, cloves, and orange peel and bring to a boil. Reduce heat to low and cover. 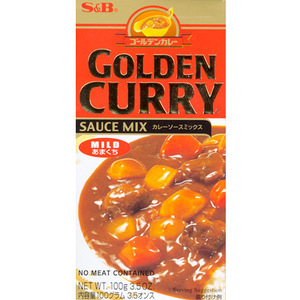 Simmer slowly according to package directions or until fork tender, 2-3 hours. Skim foamy impurities every so often. Remove brisket to a large platter and tent with foil. Remove orange peel and discard. 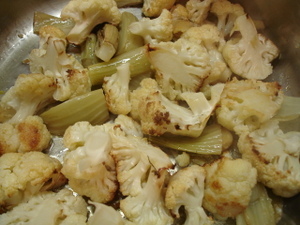 Raise temperature of liquid to medium, and add veggies to the pot. 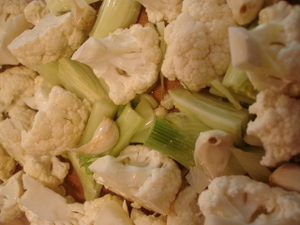 Simmer until root vegetable are just fork-tender, about 15 minutes. Slice corned beef on the bias against the grain and return to platter. 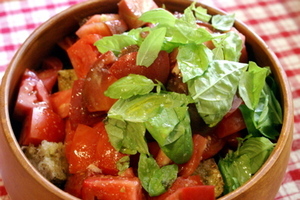 Arrange vegetables around the meat and sprinkle parsley over all. Serve with condiments on the side.